Master, Entrapment & Usurpress the 6th of June. The 6 of June we welcome American/Czech death metal legends Master to our club. With their arsenal containing 11 full length albums they rightfully retain a spot in the death metal hall of fame. http://master-speckmetal.net/With them are also Entrapment from the Netherlands. Fans of old-school Swedish death metal should make sure not to miss this! http://entrapment2.bandcamp.com/Local support are Uppsalas own Usurpress who’re bringing their own brand of d-beat death metal to completely beat the night senseless! Membership, to get cheaper entry/presale price at the door through the whole of 2014, will be available for purchase for 120kr. This event is organized in cooperation with ABF and 4Sound Uppsala. Early ticket sales concludes this Thursday. The pre-purchase of tickets will end this Thursday at six o’ clock. There are still some left at Jam Gitarrer (in Stockholm) and 4Sound (in Uppsala) so go get them! The sale of tickets online will conclude at the same time. After that it will only be possible to buy a ticket at the door on Friday. But as of yet the tickets are not sold out. Don’t worry! 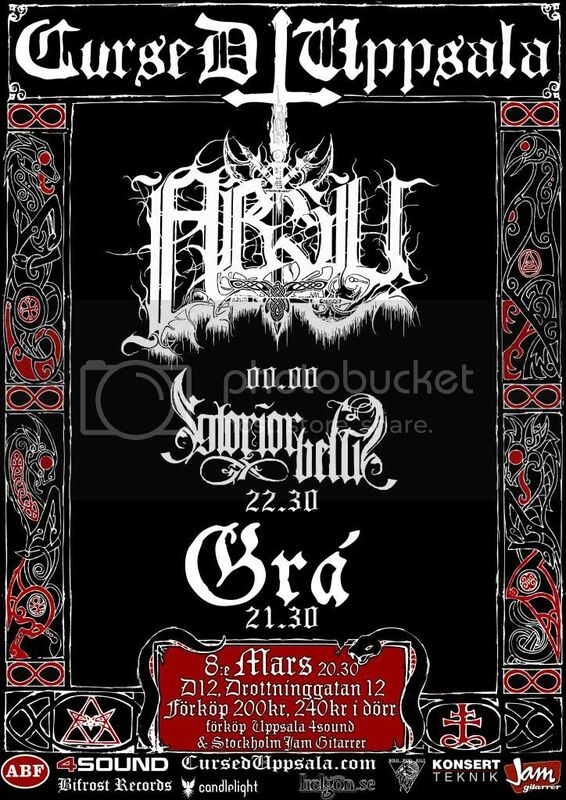 ABSU, Glorior Belli and Grá live in Uppsala! We are very pleased to finally present America’s ABSU who’ve been around for more than 20 years! It’s going to be glorious! Occult black-thrash for the people! Additionally we threw in French Glorior Belli, who excel with their unique stoner black metal. There are rumours about some old material that will be performed as well. If you missed Grá the first time then make sure to attend. We promise that these men know the art of spellbinding an audience with their cold atmospheric black metal. Tickets are limited. If there are any left they will be available for purchase at the door. Ticket price: 200kr pre-purchase, 240kr at the door. For tickets you can mail us at forkopATcurseduppsala.com or 4SOUND in Uppsala or Jam Gitarrer in Stockholm. The event is organized in collaboration with ABF, 4SOUND, Bifrost Records, Jam Gitarrer and Konsertteknik. Be forewarned and prepare for a ritual of intense, cold and occult metal. Ondskapt + Saturnalia Temple + Omnizide Live in Uppsala! Cursed Uppsala is back after a year of silence. Ondskapt is a satanic black metal constellation that was born in Stockholm in 2000. With classic albums such as “Dödens Evangelium” they have been spreading their death-worshiping tunes all over the world. They will ensure a dark curse falls over Uppsala this special evening! This doomed trio with their latest album “Aion Of Drakon” released by Ajna offensive last year will spellbind you with psychedelic black metal magic. We welcome them for the third time here in Uppsala. With the singer Nox of Craft, from the dark forests of Dalarna comes this black metal war-machine built back in 1995 under the name Belzen. The band split up, but has now returned to reign under the name Omnizide. With their brutal sound of death they will conquer Uppsala this night. Email us at forkopATcurseduppsala.com or buy then directly at 4SOUND in Uppsala or Jam gitarrer in Stockholm. This event is organized in cooperation with ABF, 4SOUND and Scenteknik in Uppsala.